David Petraeus is urging members of Congress to support President Barack Obama’s plan for military intervention in Syria. Syrian President Bashar al-Assad is suspected of launching chemical attacks on his own people, killing more than 1,400, including hundreds of children. Former CIA director and retired Army General David Petraeus says military action in Syria is “necessary” to deter other nations – like Iran and North Korea – from using similar weapons. While President Barack Obama could have used military force in Syria without the approval of Congress, he opted to put the decision to a vote. Even if Congress doesn’t approve the president’s plan – which seems likely given the bi-partisan objections to intervening in yet another war in the Middle East – Barack Obama still has the authority to launch an attack. “Failure of Congress to approve the president’s request would have serious ramifications not just in the Mideast but around the world,” David Petraeus said in a statement to POLITICO. President Barack Obama is using gruesome footage that shows the carnage in the suburbs of Demascus following the August 21, attack, when the White House alleges Bashar al-Assad launched sarin gas in areas considered to be rebel strongholds. In one of the more heartbreaking videos, a room is full of what appear to be the lifeless bodies of dozens of children. In another, men are seen foaming at the mouth and having convulsions. In all, 1,429 people were killed in the vicious attack, including at least 426 children. David Petraeus, who is widely respected amongst lawmakers when it comes to military matters, could help persuade members of Congress to support the White House’s plan for Syria. “Military action against the Syrian regime is, thus, necessary not just to deter future use of chemical weapons in Syria and elsewhere, but also to ensure that Iran, North Korea and other would-be aggressors never underestimate the United States’ resolve to take necessary military action when other tools prove insufficient,” David Petraeus said in the statement. 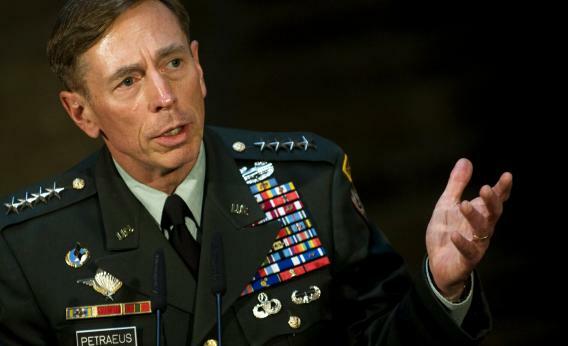 David Petraeus served as the U.S. commander for the wars in Iraq and Afghanistan under former President George W. Bush and President Barack Obama. He was tapped by Barack Obama to be the director of the CIA in 2011 but was forced to resign after an affair he had with his biographer went public. Former Secretary of State Hillary Clinton and former Secretary of Defense Robert Gates also have publicly supported the president’s call for military intervention in Syria. On Monday – when Congress is back in session – President Barack Obama will sit for interviews with six different television networks in an attempt to win public support for his plan for Syria. The interviews will be conducted by ABC’s Diane Sawyer, CBS’s Scott Pelley, CNN’s Wolf Blitzer, Fox’s Chris Wallace, NBC’s Brian Williams and PBS’s Gwen Ifill. Congress is expected to vote on the matter later this week, as support for Barack Obama’s plan continues to dwindle. President Barack Obama last week canceled a trip to California so he could stay in Washington to continue lobbying for intervention in Syria. The president was scheduled to attend a $324,000 a plate fundraiser at the home of Marta Kauffman, the co-creator of the NBC sitcom Friends.